Marie Salomea Sklodowska–Curie (7 November 1867 – 4 July 1934) was a Polish and French physicist, chemist and feminist. She did research on radioactivity. She was also the first woman to win a Nobel Prize. She was the first woman professor at the University of Paris. She was the first person to win two Nobel Prizes. She received a Nobel Prize in physics for her research on uncontrolled radiation, which was discovered by Henri Becquerel. Curie was born on 7 November 1867 in Warsaw, Poland. She lived there until she was 22. At the age of ten, her sister Zofia died. Her mother died two years later. Marie Curie was the fifth child in her family. Her original name was Marya. Her father was a math teacher. He died when she was 11. As a young girl, she was interested in physics. She was top of her high school class. She graduated at 15. Marie taught school so she could earn money to go to school in Paris, France. She also went to an unaccredited college in Poland. Eventually, she left Poland and traveled to France under the name “Marie.” In Paris, she earned higher degrees and did her important scientific work. She founded the Curie Institutes in Paris and Warsaw. Even though Curie became a French citizen, Curie never lost her Polish identity. She graduated first in her class in 1893. One year later she earned a master's degree in mathematics. Later, she met her husband, Pierre, at the Municipal School of Industrial Physics and Chemistry. They were married in July 1895. They also started to work together on scientific discoveries. Marie and Pierre had their first daughter, Irene, in 1897. Their second daughter, Eve, was born in 1904. Pierre died on April 19, 1906, after he was hit by a horse-drawn wagon. After the war, Marie started to raise money for a hospital. The hospital raised money for radiation research. She was invited to tour the United States to recommend and speed up her project. She sailed for the United States in 1921. She collected enough money and equipment for a new laboratory. She then started speaking at meetings to raise more money and became a celebrity. She also supported world peace by serving on the council of the League of Nations. Near the 1920s, Curie and many of her colleagues began to suffer from symptoms of cancer. Curie began to lose her sight. Cataract surgeries to try to bring back her sight did not help. Curie knew that the element (radium) she discovered might have been causing the symptoms, but she did not want to admit it to herself or others. In the early 1930s, Curie’s health started to quickly get worse. Doctors diagnosed her with pernicious anemia. Pernicious anemia is a blood anemia that happens when someone is overly exposed to radiation. The doctors didn’t tell the public or Curie herself what was going on. On July 4, 1934, at 66 years old, she died in a Sanitorium at the French Alps. She was then buried next to her husband in Sceaux, France. 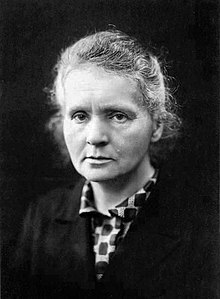 Marie Curie was a physicist and chemist best known for her work on radioactivity; however, she also discovered the elements polonium and radium. She was awarded two Nobel Prizes — one in physics which she won jointly with her husband and Henri Becquerel, and another in chemistry — and was the first person to win two Nobel Prizes. She is still one of only four people (along with Linus Pauling, John Bardeen and Frederick Sanger) to accomplish that feat. Curie is responsible for establishing the theory of radioactivity, but unfortunately she unwittingly also discovered the fatal effect radioactivity can have on your health; she died on July 4, 1934, of aplastic anemia caused by radiation exposure. ↑ "ESPCI Paris : Prestige". www.espci.fr. Retrieved 26 September 2017. ↑ Crawford-Brown, Douglas John. "Radium." World Book Advanced, World Book, 2017, Accessed 31 Mar. 2017. ↑ "Radium." UXL Science, UXL, 2008. Student Resources in Context Accessed 31 Mar. 2017. Wikimedia Commons has media related to Marie Curie. This page was last changed on 6 April 2019, at 12:42.